what household chore do you most hate doing? it's doing the laundry, for me. so the hubby washes our clothes and i do the rest of the chores while he's at it. make me wash dishes all day, i can stand it. but just staring at the pile of dirty clothes in the laundry bin tires me. i am guessing everybody secretly or openly hates doing one household chore, so what is it for you? i really hate to iron clothes. i could wash clothes by hand but definitely not iron clothes. i just hate it a lot. I'm not a fan of folding laundry. I have no issues with taking it to the washing machine or bringing it to the dryer after it's finished. I just really hate to fold it and put it away. And, I also hate hand washing dishes. I love having access to a dish washer at school and at home. I love being able to just rinse the dishes and then put them in the dish washer so I can turn it on and walk away and come back to nice clean dishes that I only need to put away. It's so much easier and much more pleasant than hand washing dishes. Folding up clean clothes is something that I would never allow anyone to do. I am very OC when it comes to this. A department store folded clothes would be ashamed when they see how our clothes are folded. 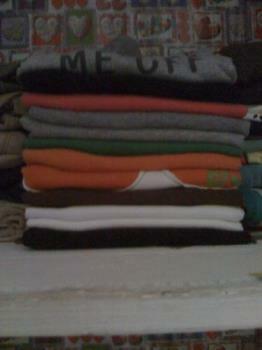 I am really very meticulous when it comes to folding. for me it is cleaning dishes. Yuck! i hate doing this. also i do not do it much. the maid does so., once in a blue moon when she is not there, i have to. I dislike cleaning the bathroom. If only someone could do it for me. Nothing irritates me more than sweeping the floor and dusting table tops. Though I like to be in a cosy surroundings with clean and fresh atmosphere, I would not like to be running around cleaning up the mess left by the kids. That routine I delegate it to my other half to do. The dust particles would make me sneeze the whole day. oh. you are the same as my husband. the reason i do the sweeping and the dusting around the house is because he sneezes like there's no tomorrow if he tries to do it himself. i can't stand the sight of a dirty sink, so i'm not one to pass up on doing the dishes. I have no problem with washing the clothes since i just put them all in the washing machine and press teh start button. I hate ironing. I have told my hubby many times not to buy pants and shirts which are difficult for me to iron. I asked him to buy wrinkle free ones but he hate those. I think it is a waste of electricity (increasing every few weeks) and money. So I told myself to buy clothes which are wash and wear types or easy to iron, in just a few minutes. The main reason why I hate it is that I have to stand and I get all hot and sweaty from it. When no one's at home I usually turn on the music to make me feel better about the chore. A real chore for me. You sometimes I wish there are people who hates the opposite chore as you do living next door, so you could swop chores. I hate cleaning my kitchen, and that includes washing my dishes. That room get messy faster than any other room in the house. I think it takes the longest to really clean too. If we had a dish washer I think it would go faster and I would mind it as much. Maybe we will get one some day! For me it's folding the laundry once it is washed. I'll wash all day long, I simply don't like folding them up and putting them away though.